A beautiful, blushing box for a beautiful, blushing someone filled to the brim with luxurious goodies galore! Bath bombs, scrubs, soaps, oh my! 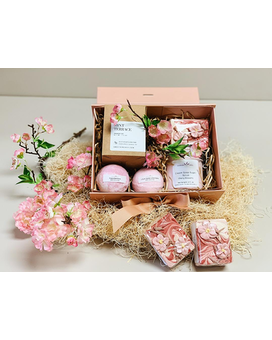 Pandora's Box supports local artisans and is a sweet and dreamy treat for someone special in your life, on any and every occasion. This is our special Cherry Blossom Edition, in honour of the blooming Cherry Blossom season!